Samsung is reportedly working on launching a new smartphone with a fully borderless display. The company has already filed the patent for the same. Samsung Display Co. Ltd filed a patent with the WIPO (World Intellectual Property Office) in April of this year for a ‘Display device and electronic device including the same’. 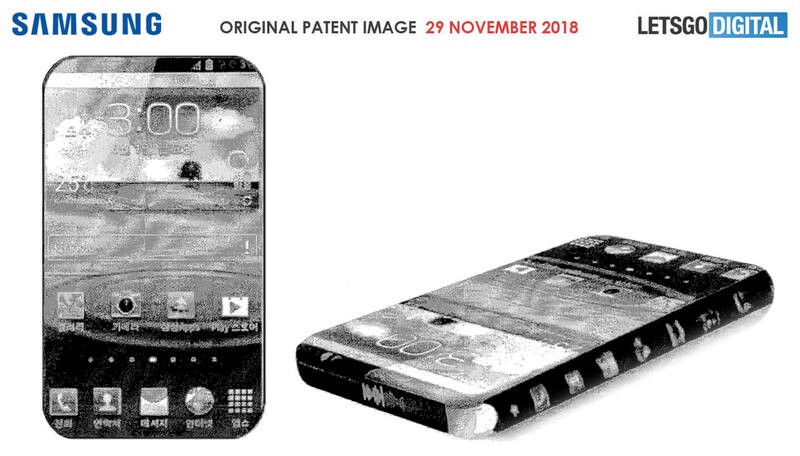 The patent was published on 29 November 2018 and describes a Samsung smartphone with a borderless display, in which the four sides of the device also consist of the screen surface. 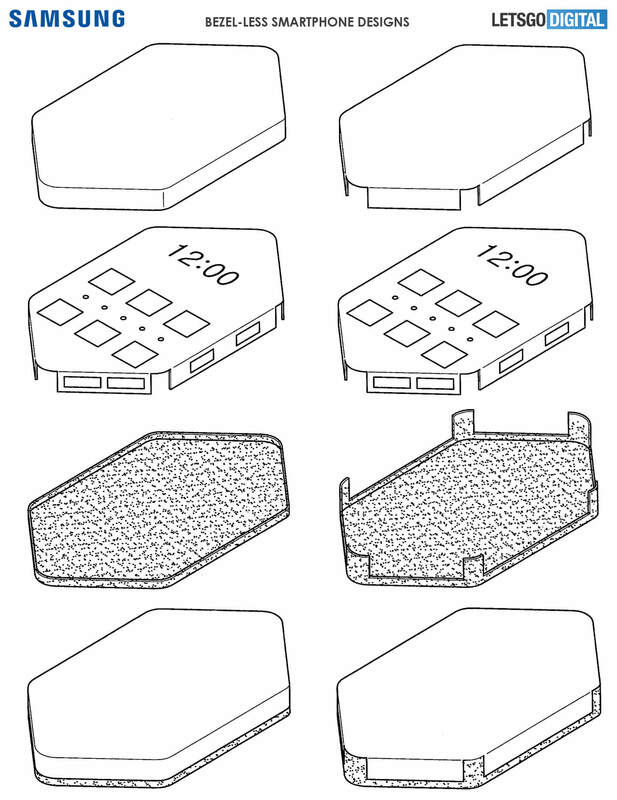 What is striking about this patent is that Samsung has also added two product images. This is very unusual with a so-called utility patent. Normally we only see such photos in a design patent. Although the quality of the photos leaves something to be desired, they show exactly how the borderless Samsung smartphone will look like. The patented Samsung smartphone has a flexible display that runs from the front to the four sides. The screen is bent at an angle of at least 90 and at most 150 degrees, giving the device a nice rounded corner. The same is done with the cover window, which is placed above the display. There is no metal frame on the side of the phone, it is a completely borderless smartphone. The back is attached to the display and the cover window. Two possibilities are shown for this. The four corners can contain a cut-out, making it easier to click on the display and the cover window. On the supplied images, however, Samsung seems to choose the other, more stylish model. The flat back is attached to the cover window, possibly it is glued. 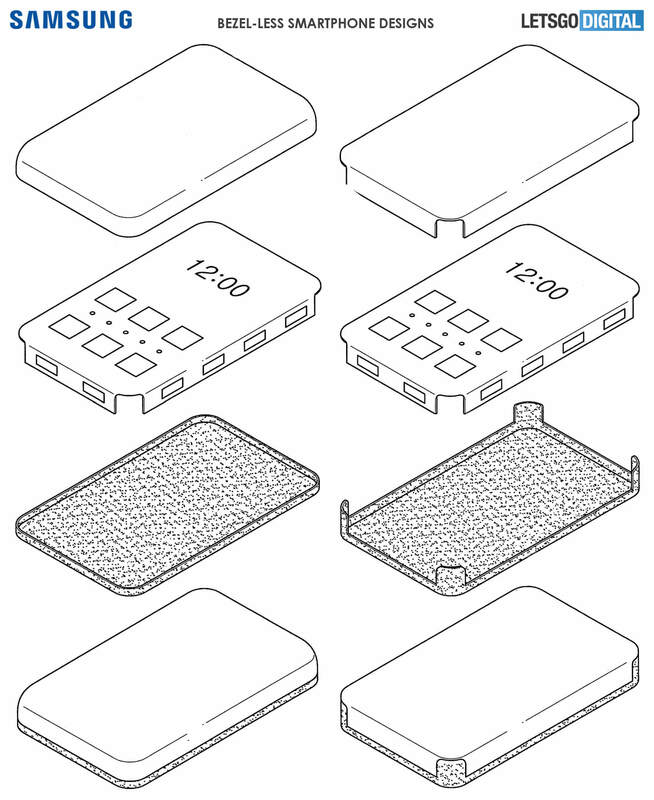 The patent does not elaborate on the possibilities of the display areas on the sides of the smartphone. From the two black and white photos supplied, however, it appears that icons can also be shown here. Think of application icons for calling, sending a message or opening the camera app or multimedia player. Although this is not discussed literally in the patent, it seems plausible that the speaker, selfie camera and various sensors are processed under the display. Furthermore, there seems to be no room for a headphone connection in this borderless smartphone design, I also do not see a USB Type-C connection. It is possible that the patented Samsung smartphone can only be charged wirelessly. The display can also have different shapes. In addition to a rectangular design, a polygonal design with 6 corners is also used. The patented display technology can also be used for other electronic devices. For the time being, it is a matter of looking at coffee when such Galaxy smartphones are being put on the market for the first time. Later this month the Galaxy A8s is expected, this will be the first Samsung smartphone with a camera hole in the display. Huawei will also introduce a similar design almost simultaneously to the Huawei Nova 4. Competitor Vivo takes a different approach, this relatively young and innovative smartphone manufacturer chooses a second display. Yesterday, the Chinese manufacturer put a teaser online for the Vivo Nex 2, this revolutionary phone is also expected in December 2018. The Nex 2 probably gets a second display on the back of the smartphone, making it possible to take selfies with the main camera. Incidentally, in the past, Samsung has already applied for several patents for a telephone with a double-sided screen.